There's nothing boring about this basic. A straightforward toe, lustrous shine, and commanding height keep your look exciting at work and play. Napa leather polishes a simple silhouette with notice-me shine. 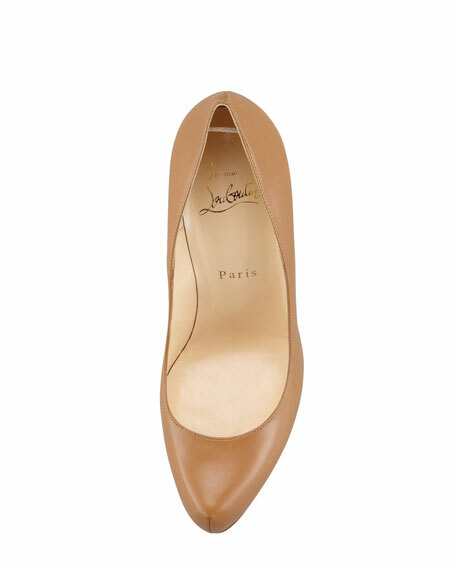 Pointed toe with topstitched center frames low-cut vamp. Approx. 4 3/4" covered heel shows off signature red sole; concealed platform lowers pitch. Creamy leather lining with padded insole. "Rolando" is made in Italy. Please Note: Heel height may vary with shoe size. This shoe has a short toe box. We suggest that you order a size larger than you would normally wear.